Can I Sue Thomas Pynchon? Julian Benfield is the owner of Julian’s Books, a rare and used book dealer in New York since 1997. Prior to that he worked for Xerox in engineering and marketing management, and as a computer consultant. He holds a Bachelor’s degree in Mechanical Engineering from The Cooper Union, and MBA from Rochester Institute of Technology. His coolest offering is currently a signed copy of Mason & Dixon. In 1999 I was able to outbid other New York dealers and collectors to obtain a signed first edition of Mason & Dixon by Thomas Pynchon. This was offered by The Cathedral School of St. John the Divine, where his son was in attendance. The following year, I was able to repeat the feat to obtain a signed Crying of Lot 49, again at Cathedral School’s annual fundraiser. While the books were just signed on the title page, I was told, after the auction, that Pynchon would be happy to personally inscribe the books if I so desired. Since I was buying for resale, I thought that it might be best to not request that. Some may disagree, but that was my choice. Fast track to a few years ago, when I was negotiating with a potential buyer for Crying Of Lot 49, and mentioned that I never took Pynchon up on his offer to personalize the book. 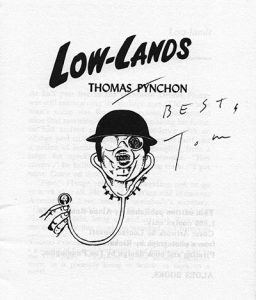 My customer, who subsequently paid $23,500 for the signed Lot 49, immediately asked if Pynchon would inscribe it to him. That’s where my saga started. 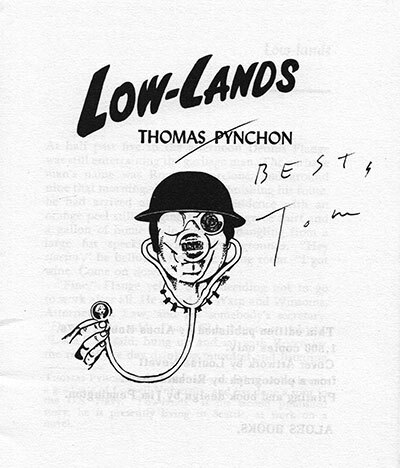 If only measured by his influence on our culture, Thomas Pynchon is an iconic writer. His name is known to many who have never read a word of serious literature, and “Pynchonesque” seems to have as many interpretations as the identity of the mysterious V. in his first novel, V. Pynchon’s earliest writings leapt onto the scene to accolades rarely given to a new author, and he was hailed as one of the bright stars of a new literary generation. His first novel was a winner of major national awards and his magnum opus, Gravity’s Rainbow, nearly won a Pulitzer Prize (more on this later). His subsequent efforts have not failed that early promise. Pynchon’s novels feature dense, convoluted plots, with wide-ranging allusions to history, science, technology, mathematics, and popular culture. One does not just “crank out” works that offer such challenges and rewards to their readers. Indeed, Pynchon has produced just eight novels over the past fifty years. Fortunately for the collector, the existence of variant forms of his novels and of many associated publications can make collecting Pynchon a challenge worthy of that found in reading his books. An essential reference for the Pynchon collector is Clifford Mead’s 1989 book, Thomas Pynchon: A Bibliography of Primary and Secondary Sources. Although written 27 years ago, it remains the best description of the author’s early works. In addition, it includes the first appearance in book form of Pynchon’s juvenile writings. The presence of these contributions from young “Tom” to his high school newspaper makes Mead’s work a collectable Pynchon text as well as a bibliography. Notorious for keeping his personal information private, Pynchon can make Salinger look like a publicity hound. It is known that he studied at Cornell, and that Vladimir Nabokov was one of his professors. Prior to pursuing his career in literature, Pynchon served in the U.S. Navy and then worked at the aircraft company Boeing as a technical writer. The abundance of military and technical references in his books indicates how much these experiences informed his writing. Pynchon’s articles in Aerospace Safety and BOMARC Service News are not only informative, but fun to read, even given their highly technical content. BOMARC Service News poses an interesting challenge for both the academic and the collector, since none of its articles are credited. Textual analysis has identified articles that can be credited to Pynchon with varying degrees of certainty and the magazine issues containing these are rare and quite collectable. What does F = ma have to do with “Entropy”? 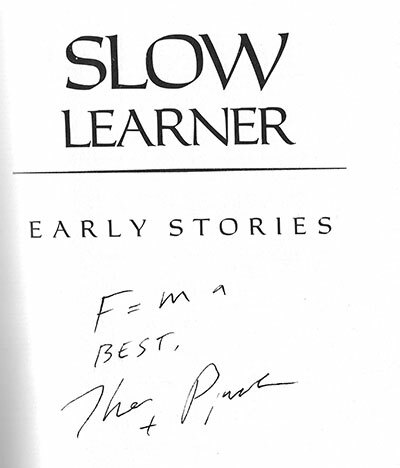 Among the books owned by the late UNIX pioneer Greg Chesson are two signed copies of Pynchon’s story “Entropy,” a bootleg edition and a first edition of the collection Slow Learner. 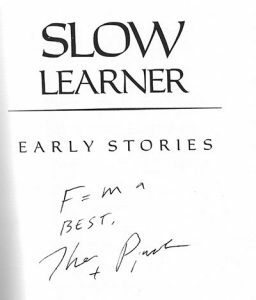 In both copies, Pynchon did something unusual: along with his signature, he inscribed the equation for Newton’s second law of motion, F = ma, i.e., force (F) equals mass (m) times acceleration (a). In the bootleg edition, Pynchon went even further. 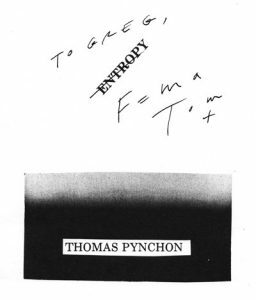 Rather than cross out his printed name above his autograph, which authors sometimes do to emphasize their more personal signature (see the Low-Lands autograph below), Pynchon instead crossed out the word “Entropy” and wrote the equation beneath it. Why would Pynchon write down Newton’s second law on a copy of a story about the second law of thermodynamics? One possibility is that this is a bit of an inside joke and a note of encouragement to a friend – hence the crossing out of the title and its replacement with F = ma in the bootleg copy. Intuitively, entropy suggests dissolution, a system that’s running down. Pynchon’s story muses on the negative consequences of the inexorable increase in entropy: disorder, death, and the ultimate end of the universe. F = ma suggests the opposite – a positive force, acceleration rather than loss of motion, an ability to act to alter the world, rather than simply let things run their course. For both the original hardcover and paperback versions of Gravity’s Rainbow, the differences between the true first editions and the Book Club editions are fairly subtle, but easy to spot. When the Viking Press published Thomas Pynchon’s Gravity’s Rainbow in 1973, it simultaneously issued 4,000 hardbacks and 16,000 paperbacks. The reason for publishing the less-expensive paperback ($4.95) at the same time as the hardback ($15.00) was due to the concern of Corlies “Cork” Smith, Pynchon’s editor at the time, that Pynchon’s readership — younger, college-educated, hipper — might balk at coughing up $15 for the novel. As you may know, both editions in their first printings are quite valuable, particularly the hardcover (and even superior copies of subsequent printings of the first edition), but also the first edition/first printing of the paperback edition. However, the differences between true first editions and the subsequent Book of the Month Club (“BoMC”) (hardcover) and Quality Paperback Book Club (“QPBC”) editions of Gravity’s Rainbow, both published in 1973 (Thomas Pynchon: A Bibliography of Primary and Secondary Sources, Clifford Mead, p.13), are a bit subtle, but easy to identify when you know what to look for. NOTE ABOUT VALUE: First editions of both the hardcover and paperback editions of Gravity’s Rainbow are only of significant value if they’re first printings, although later printings of both are still pricier than later editions. Printings subsequent to the first printings are clearly indicated on the copyright page, after the line “Printed in U.S.A. by the Colonial Press Inc.” If there is no indication of a subsequent printing, then it’s a first printing (assuming, of course, it meets the other criteria in this article). Both the hardcover and paperback editions went into multiple printings after the first run. BoMC hardcover editions generally go for between $100 – $300, depending on their their condition (VG to Fine). The QPBC paperbacks are not worth that much at all and should only fetch more than, say $10, only if they are misrepresented as first editions.